Russian tourists have been put off by high hotel prices in London, but they still managed to stock up on sporting goods. Tourists from Russia spent more than $17 million in London from July 23 to July 29, according to the Visa payment system. Visa card expenditures by Russians rose by a third compared to the same period in 2011. However, so far this year, Russians in Britain rank 12th by amount spent according to Visa, which issues reports based solely on transactions with Visa cards. Every third British pound spent in the UK is paid using a Visa card, the payment system says. For country-specific Visa expenditure reports, the firm considers the location in which the card was originally issued. Visa card expenditures were on the rise by an estimated 30-40 percent, despite a fairly small number of Russian tourists visiting London during the Olympic Games. Alexei Popov, general director of BSI Group, believes that up to 15,000 Russian tourists will visit the Olympics at best, partially because the prices for hotel rooms in London have doubled and tripled during the Games and Russians tend to save on accommodation during their vacations. Popov said that a week in a five-star London hotel usually costs 1,500-1,700 Euros earlier, while during the Games, prices have climbed to 3,000-3,500 Euros. According to Visa, Russians spent just $1.4 million on hotels during the first week of the Olympics. Alternatively, they are willing to spend on car rentals, entertainment and shopping – Russians spent $6.2 million on entertainment, theater and shows, $2.3 million on clothing and $1.7 million on other goods and services. Spending on sporting goods rose an impressive 336 percent - many Russians are purchasing sportswear, training shoes and equipment with the Olympic logo, Visa reports. 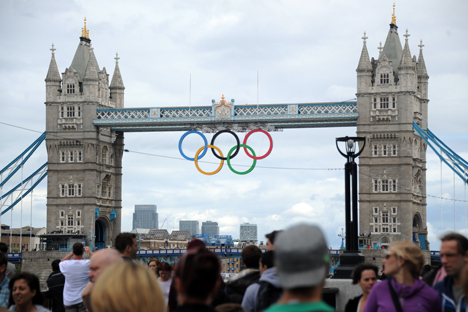 Tourist outlays in London during the Olympics have reached about $700 million, according to the Visa report. The biggest spenders so far are visitors from the U.S., Japan and France. Previously, Visa projected revenue of $1.2 billion for the UK during the seven weeks of the Olympics and Paralympics. In comparison, Visa card spending during the 2010 Vancouver Winter Games totaled $115 million, of which Russian tourists spent $4.3 million (ranking fourth by overall expenditures). The original Russian version of this article is available in Vedomosti.ru.